This years gatherings will be around the topic of searching for conceptualising and developing the tools we need to make self-empowered culture work better. The 2019 gatherings will start on May 26th and will go on until at least June 12th. Découvrez également la webapp DelDj, afin d’unir la création visuelle avec la création musicale et parfaire cette expérience synergique. As we recognise the need to see global challenges as a requirement for more global coordination and cooperation, and hence, the need for governance to become one global organisation, we at the same time see organisations of all sizes shifting from simple decision making structures towards a more complex governance culture. Governance at any level and organisations of any size are becoming increasingly synonymous concepts. 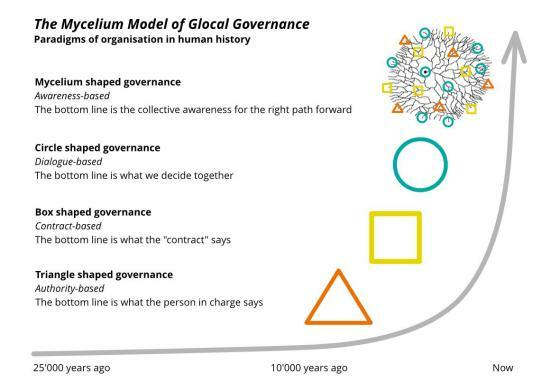 In recent human history, different paradigm shifts in how we organise and govern have come about at an increasing pace. From a triangle shaped governance, that is authority based and where the bottom line is what the person in charge is saying, to boxed shaped forms of organisation where the bottom line is what the "contract" says, to circle shaped governance, which is dialogue based and where the bottom line is what we decide together. These waves of new forms of organising have spilled into the cultures of our society in ways where the older organisation structures continued to exist in parallel. The new organisations tend to form along side old ones, but grow to increasing importance, while the older organisation structures slowly fade in their relevance. On the historic time scale, authority based organising has shaped our governance for thousands of years while contract based governance has become of primary importance during the past centuries. In comparison, dialogue based, collective decision making has really been gaining only during the past decades, with a vast amount of our governance structures still dominated by the earlier forms of organisation. However, we see an exponentially fast transformation happening towards the more advanced forms of organising, to the point of new paradigm shifts happening already before the impact of earlier shifts is fully felt in society. We propose that the new shape of a governance culture to meet current and future challenges is that of the mycelium. "I have increasingly come to regard the mycelium as a heterogenous army of hyphal troops, variously equipped for different roles and in varying degrees of communication with one another. Without a commander, other than the dictates of their environmental circumstances, these troops organise themselves into a beautifully open-ended or indeterminate dynamic structure that can continually respond to changing demands." The word “mycelium” literally means “more than one”. The plural form is Mycelia. The word has modern Latin and Greek origins and was first coined in text in the early 1800’s, and refers to the thread-like body of a fungus. The spores of most fungi grow a network of branching filamentous hyphae, which spread into the existing organic structures. In most fungi, hyphae are collectively called a mycelium. The hyphae excrete enzymes that break down the old and turn it into compost, which serves as nutrient for the emerging new. Where hyphae gather to form a whitish mycelium-soil aggregated zone, called the shiro, a mushroom will come out as the fruit bodies of the mycelium, with its spores spreading to grow new hyphea elsewhere. Like a spore from a mushroom, people that carry the awareness about a collective consensus in society, will be motivated to move to action along that path. Like hyphea, they will grow to find others that they can join in order to implement projects for manifesting the change that is called for. Or they will be motivated to further explore related aspects regarding that challenge and gather in groups with others that share that interest. Like in shiro, these gatherings, with the use of best practice processes, will create consensus outcomes statements that, like mushrooms, send the spores of that newly gained awareness out in society. We trust the open processes that the model affords and distrust the closed processes of existing structures which are bound by bureaucracy and secrecy. 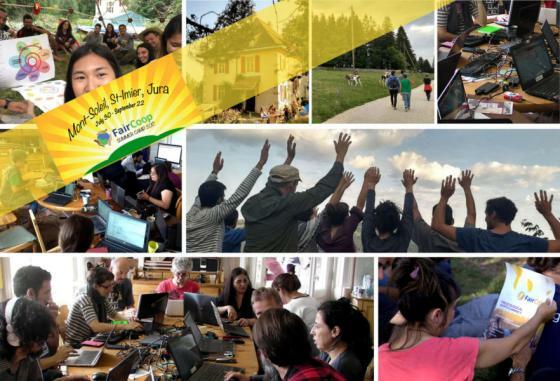 The value system of humanity we believe to be intrinsically good and aimed at what is the better and the right course of action for all, for all life on the planet. In our case our process happens before the decision happens and happens ahead of time. It speeds up the process, because those participating in the decision making can take the outcomes into account, therefore it makes the decision making process faster and is likely to increase the quality of the outcomes. Ideally, decision makers will feel that there is no decision to make because of it being clear what needs to be done. With a Mycelium governance culture, it is more likely that implementation of decisions within societies and within decision making structures are met with less resistance because the process of agreement has already been dealt with through through the awareness for what consensus exists in society. If a community is more committed to the course of action, then it is easier to implement such action. At its fundamental level, the Mycelium model is a self-empowered, decentralized, bottom up governance structure for which the resources can be obtained without top down aid. The most important support that it can receive would be to not expend top down resources to try to suppress its emergence. Ideally, a broad consensus in the United Nations general assembly would encourage nation states to have a supportive attitude towards the emergence of a Mycelium governance culture. As the action of moving forward with manifesting changes happens outside the Mycelium governance structures themselves, the existing and emerging governance structure will have or will obtain the required resources for implementing change through their existing means. If anything, these changes, due to them being supported with larger awareness in society, will have an easier time to obtain required resources and financing in a matter that is equitable and fair. This model gives back the power into the hands of the people, by empowering them through the collective awareness. People will regognize themselves to be a sovereign part of the manifestation of change. They will feel responsible to maintain and increase the quality of the governance processes and hence its transparency. The outcomes of these processes are shared with everyone in the society and fears are overcome with truth. This in turn will strengthen the emerging Mycelium culture of governance to itself become a strong web of trust. As part of that, transparency about the groups that gather, the processes they use and the way the outcomes are shared are important meta data of the outcomes themselves, essential for that web of trust. Because this governance model is decentralized and bottom up, it will self regulate in this regard. A Mycelium governance culture, like a mycelium in nature, is highly adaptive to the evolving environment around it. In many ways, it is a meta governance structure to old governance structures that exist and new ones that emerge. Hence, it itself has less of a need to change. The ever evolving parts are the tools and best practices that are used to continuously improve the quality of the different processes in the Mycelium governance cycle. Continues and divers improvement and evolution of these parts is an integral part of the model and is self regulating. 7. Protection against the Abuse of Power. The Mycelium model is based on sharing consensus and raising awareness in society and doesn't make or implement ANY decisions. Since it itself does not have any power to manifest the change, it can not overstep its mandate. By separating the awareness and the implementation processes we create natural checks and balances that prevent abuses of power from happening. Through the increased awareness in society, the model also serves to make abuse of power in other existing or emerging governance structures less likely. The accountablilty of those that implement projects and manifest change, as well as of those that make decisions in existing governance structures, is not impacted or changed in any way by the Mycelium governance culture. 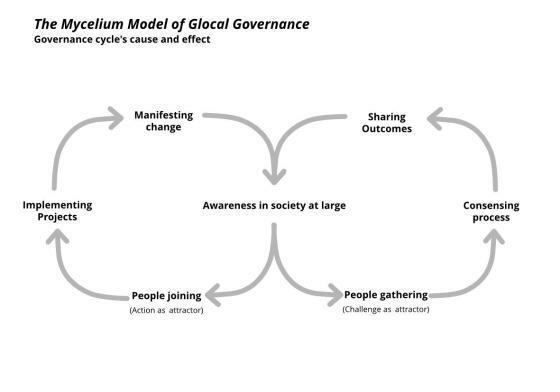 Through the higher awareness in society, the accountability in these other governance structures, as well as the accountability of anybody manifesting change or trying to prevent it, will tend to increase due to the Mycelium governance culture.